Malachite was first found in hoary antiquity in the south of Iran, where King Solomon’s Mines were situated, as a legend says. However, the richest in colour and patterns was the Ural malachite, known the world over. The stone has various tints of green: from light green with bluish to dark green, almost black. Reniform formation of the mineral creates amazingly intricate inimitable patterns on its cuts and polished surfaces, demonstrating the unsurpassable beauty of nature. Because of this tracery the Ural malachite was called “the peacock stone” in Old Russia. The name of the mineral derives from the Greek name of mallow, the leaves of which have the colour similar to malachite. Quite often malachite was found together with blue lazurite; the coalescences of the two minerals are very beautiful. In order to see the splendid articles of the famous Ural malachite one should go to a museum and the best choice will be the Hermitage Museum, which boasts a whole malachite hall. 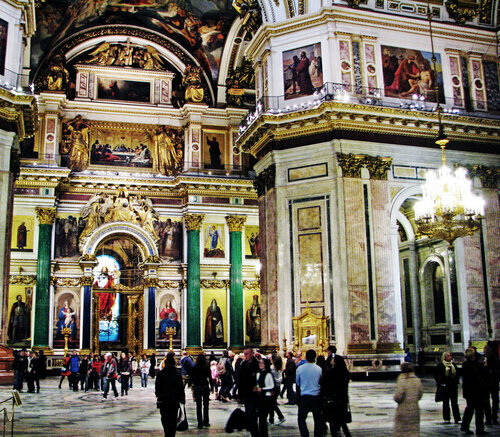 The biggest malachite item can be found in the St. Isaac's Cathedral in St. Petersburg – the columns of the altar there reach the height of almost 10 meters. 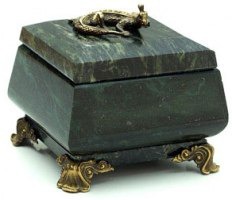 Practically in any museum palace one can find articles made of malachite of the 19th century. These are table tops, fireplaces, vases, caskets, candelabra and various decorations made of this beautiful green stone with fanciful yet natural tracery. The huge antiques seem to be made of enormous malachite boulders, but that is an illusion. The method of making them is called “Russian mosaics”. The item itself was made of some other material, such as, for example, marble or metal, above which thin blades of malachite were pasted. It was very difficult: one had to saw a piece of malachite perpendicularly to its schistose structure into blades not thicker than 1 mm, then put these fragments together in such a way to create a single pattern, and afterwards rub the junctions with a special mastic to conceal them. What made it still more difficult was that the surface of the articles was not always flat. Ural malachite masters were peerless in their craftsmanship. How hard their work was, in what conditions they worked and what a price they paid for their mastery, loosing their health! The heyday of Russian malachite fell on the early and mid 19th century, when the biggest deposits - Gmeshevskoe and Mednorudnyanskoye - were discovered in the Ural Mountains. The biggest piece of malachite weighed about 250 tons! Tons of Ural malachite started to be mined, it was widely used as facing material, and considerable amount of malachite stones was exported. The debris of malachite was used for production of malachite green paint, with which roofs of houses in the Ural were often painted in that period. 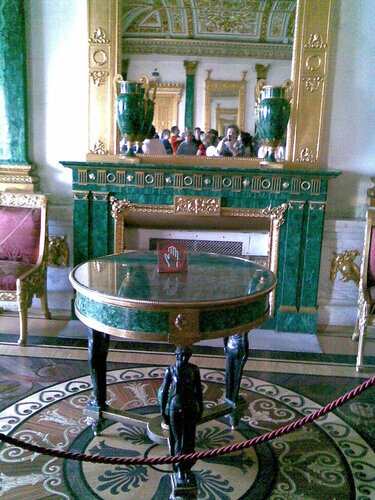 European masters used malachite in a way different from Russians; partly that was because of their thriftier attitude to the expensive material. The green stone was used in Florentine mosaics, where the patterns were made up of various minerals: blue lazurite, red jasper, marble and granite. Malachite was processed in various ways: it was faceted, cut to make stamps and decorate silverware, tea sets, etc. Unfortunately it was used on such a great scale and mined so devouringly, that its deposits were soon depleted. That was the sad real story, parallel to the fanciful folk legends inspired by the magnetic green stone and put down by the famous Ural writer Pavel Bazhov in his Malachite Casket. There are not many malachite occurrences in the world now, and the minerals mined there are not as beautiful as Ural malachite. Presently the major provider of malachite is Zaire. From the early 19th century attempts were made in different countries to reproduce the natural process of malachite generation. Only in the second half of the 20th century Petersburg scientists developed the unique technology of growing natural malachite. Experts prove that this synthesized malachite is a total analogue to the natural malachite, similar in chemistry, structure, and other physical qualities. 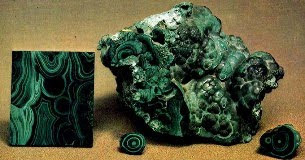 Modern items of malachite are modest in size as compared to the luxury of the past centuries. These are mainly jewels: earrings, pendants, bracelets, rings, brooches and necklaces. Looking at these enchanting pieces one cannot help recalling the Mistress of the Copper Mountain, a mythic patron of malachite riches.